A few months back, we got an invite to participate in the Department of Education’s Ed Games Expo. (Thanks to USDA for putting us in touch with the expo’s organizers!) The event brings together educational games from across the country that were funded by Small Business Innovation and Research (SBIR) awards granted by various federal agencies. It sounded like a great opportunity to demo our games, earlier this week, I boarded a plane to our nation’s capital. 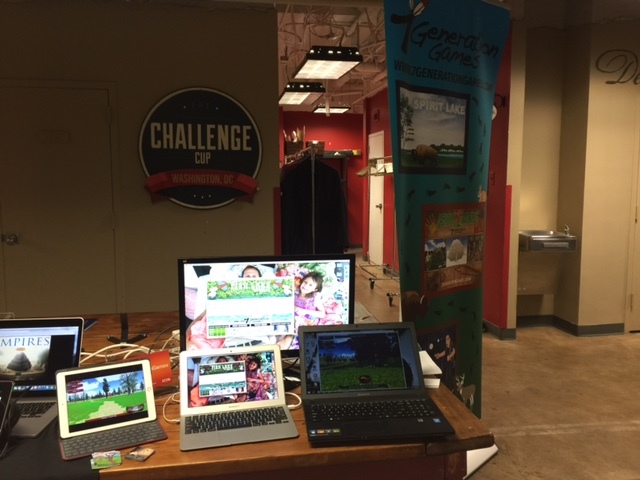 The Expo featured over three dozen companies, that had created more than 50 total games, demoing their games at 1776 in Washington, D.C. For 7 Generation Games, I got to show off not only the three games we created under our first grant (Spirit Lake, Fish Lake and Forgotten Trail), but Aztech also made its world debut. It was a very early version of an alpha level of Aztech, but it was really exciting to give a sneak peek into not only what we’ve done, but what we’re doing. I had the incredible honor of showing our games to Small Business Administrator Maria Contreras-Sweet. As a SBIR recipient from USDA, we truly strive to be a positive example of what can be achieved through by the support of these grants from federal agencies. To be able to show that these funds are not only allowing us to build a business, but make an impact on math education was so rewarding. Another of the event highlights for me was when two boys – right around the target age for our games – spent about 20 minutes at the table playing through the entire Fish Lake and Spirit Lake demos. I never get tired of watching kids play our games. We wanted to create math games that kids want to play, and we have. What I also took away from the event was what an exciting time it is to be part of what I truly believe is a revolutionary time in education – and just how many smart people are working and committed to making that change happen. At 7 Generation Games, get to be part of shaping the future of education – which really means shaping the future of our youth. That’s an amazing goal to be able to get up and pursue every day. And there is a really solid community of other folks out creating educational games that do everything from teaching reading to science to music and more. My only complaint was that I was so busy demoing our games at our table that I didn’t get a chance to try out all the other games – but that’s a good problem to have! We’re so grateful for Ed Metz of IES for organizing and inviting us to participate as well as to Dr. Charles Cleland and Scott Dockum of USDA for coming out and seeing what we’ve been developing with our SBIR award. I’m not going to lie, after a couple of chilly December days in D.C., I was looking forward to heading back to L.A., but I also can’t wait to come back for the annual event next year!